After Mandarin, Spanish and English, Hindi is the fourth most-spoken language on the globe. It is the official language of the Republic of India along with the English language. But Hindi and English are not the only two official languages, there are 22 languages altogether. The Indian constitution has not recognized Hindi as the national language of India; no language in India has been given such a status yet. If India is divided into two halves with a line horizontally through the middle, the top half is where Hindi is almost exclusively spoken. However, India is not the only country where Hindi is spoken. Several other countries recognize Hindi as an official language, like Fiji, Trinidad and Tobago, Guyana, Suriname and a few more, but in those countries, the Hindi is different from the Standard Hindi language spoken in India. Instead these Hindi languages descend from other dialects of Hindustani. Hindustani, also known as Hindavi, Dehlavi and Kekhta refers to a mixture of Hindi and Urdu which is also recognized as lingua franca of northern India and Pakistan. There are a few words used differently between Urdu and Hindi, but the spoken Hindi is mutually intelligible with Urdu. You’re On A Roll! = आप सफलता की कगार पर हैं! 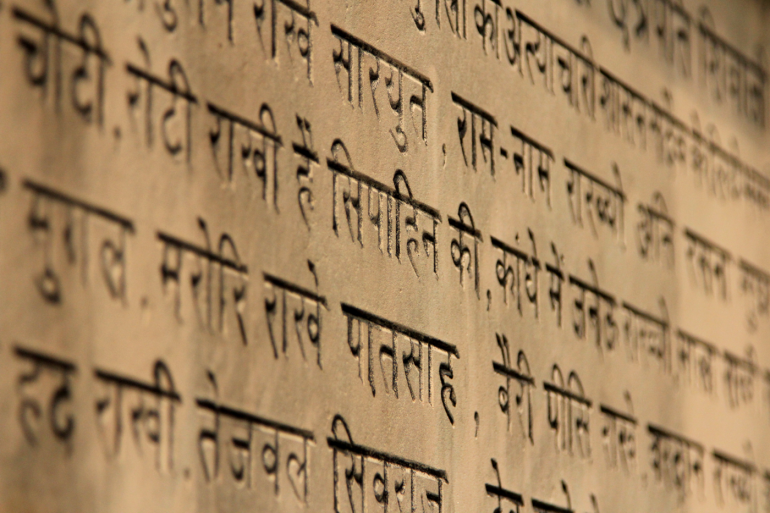 The Hindi font can be easily recognized by a horizontal line above the letters. To type in Hindi, a special operating system is required. But not just Hindi, also every other Indian language uses special character fonts and also requires a special operating system to display the font properly. To assure that the font displays properly, we deliver our Hindi translations in Unicode font in MS Word, PPT or Excel as well as in PDF. We can also format any text in InDesign or create an e-learning program in Articulate. Formatted files can also be delivered as high resolution PDF ready to print.